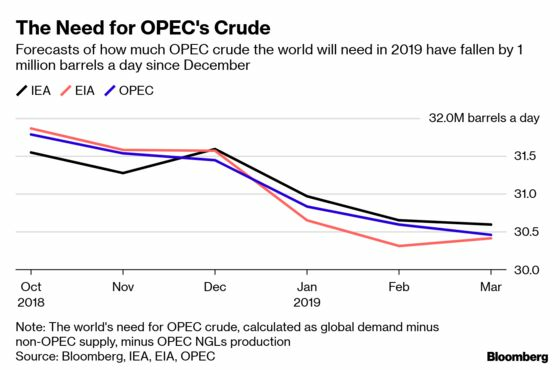 (Bloomberg) -- OPEC members have done just about enough to bring oil production into line with the world’s need for their crude in 2019, but they will have to keep the restraint going throughout the year, just to prevent stockpiles from rising. To drain them further, as Saudi Energy Minister Khalid Al-Falih believes they must, they still need to do more. A committee of the most influential members in the 24-nation alliance of OPEC and non-OPEC countries met in the Azerbaijani capital, Baku, on Sunday and Monday and agreed to go beyond their pledged 1.2 million barrels a day of supply curbs in the coming months. The latest forecasts from supply-and-demand studies of the oil industry’s most-watched organizations—the International Energy Agency, the U.S. Energy Information Administration, and the Organization of Petroleum Exporting Countries itself—show that they will need to do just that. The three agencies are coming to a consensus view that the world will need around 30.5 million barrels a day from the OPEC countries on average in 2019. That’s about the same amount as the group pumped in February, according to secondary source estimates published by OPEC. But while that’s adequate to keep inventories as they are now, production is still too high to achieve Al-Falih’s objective of draining inventories further. 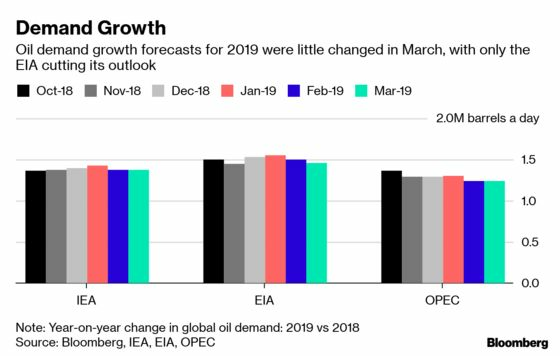 The Paris-based IEA and OPEC both kept their forecasts for oil demand growth this year unchanged from February. In contrast, the Washington, D.C.-headquartered EIA, which sees the strongest demand growth among the three, trimmed its outlook slightly. But the biggest change on the demand side of the agencies’ balances was to the fourth quarter of 2018, where all three agencies have cut their assessments. The biggest reduction was made by the IEA, which lowered projected consumption for the period by 450,000 barrels a day as a result of “feeble growth in OECD countries.” OPEC lowered its assessment by 210,000 barrels a day and the EIA by 150,000 barrels. The agencies also diverged when it came to changes in non-OPEC supply growth this year. OPEC was alone in raising its forecast, with the biggest revisions being made to the OECD Americas region. The IEA and the EIA both trimmed their outlooks for incremental production. Their alterations also driven by changes to their views of the amount of new production coming from North America. In all three cases, though, incremental non-OPEC supply continues to outpace the growth in global oil demand. 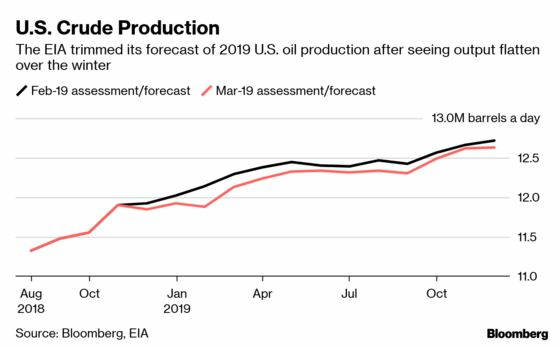 The EIA made downward revisions for U.S. output throughout 2019, with the biggest cuts of all—about 200,000 barrels a day—falling on February, when the nation produced about 11.9 million barrels a day. The reduction from one monthly report to the next should come as little surprise given the extreme weather that hit large parts of the U.S.
OPEC and its friends have done just about enough to bring oil supply and demand into balance in 2019, but they have not yet cut output far enough to start draining stockpiles on average over the year. For this year, the IEA and OPEC both see small draws over the two northern hemisphere summer quarters, but these are more than offset by bigger builds in stockpiles in the current quarter and again in the fourth quarter. Stricter compliance with agreed output targets from those countries that are lagging in their implementation of the December deal could tip the balance into deficit. So too could further falls in oil production from Iran or Venezuela, both of whom face a possible toughening of U.S. sanctions in the coming weeks. 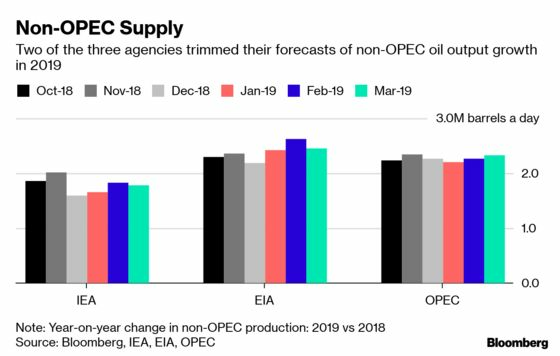 Such is the uncertainty around the outlook for production in those two countries that it is little wonder that the OPEC+ group looks like scrubbing a planned April meeting, instead postponing a decision on the future of its output deal until June. 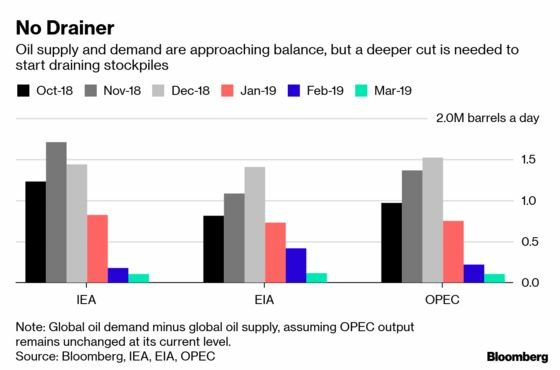 Note: This monthly story will keep track of the big oil agencies’ supply, demand and balances figures on an on-going basis. Note: Julian Lee is an oil strategist who writes for Bloomberg. The observations he makes are his own and are not intended as investment advice.